U.S. Burglary Rate: 1 in 15 homes a day?!?!? -- BOGUS!! Disagreement over "Crime spike as lights are switched off in Eastbourne and Hastings"
The Story of ATM Robbery Victim, Hudson, Mass. What to do Before the Burglar Comes. Light pollution, especially glare lighting is a safety and a security risk. Glare lighting causes two problems with our eyes. First because it is typically a strong contrast to the night, any night vision we have built up ends. Our rod cells become saturated and overwhelmed as the cell's needed rhodopsin (which is the reason we eat high vitamin A foods, like carrots) is broken down in the light. Rod cells are what we use to see in the dark and this light shuts down our night vision capabilities. The rod cells' sensitivity is a thousand times stronger than our color sensing cone cells, but it takes over forty minutes for them to produce enough rhodopsin to achieve this capability, even longer for older eyes. To protect themselves, our eyes constrict or stop down their front apertures, meaning our pupils close. These two results, the constricted pupils causing less light to enter our eyes and the over-saturation of the rods leading to their diminished sensitivity, causes us to be temporarily blind at night in the presence of glary light. The cones still work, of course. And they can see the glare lighting and its color very well. But they cannot see into darker regions that may be beyond the glare lighting or into shadows that is typically caused by the glare lighting. To do that, we would need fully functioning rods, which we do not have them, we are now night blinded. It is that condition that risks our safety. In fact, it can be that because of all of this light that people, thinking that it is so bright due to the glare lighting, may then take risks that they SHOULD NOT do for a given situation. Excessive lighting creates safety concerns for home or business owners, in addition to the health problems for us and problems for the environment. Using lighting for safety's sake is only beneficial if you have someone to constantly watch whatever is being lit. Bad lighting enables an intruder who, as a mere street pedestrian, to come by and case out your property. Your own light clearly gives him information about your house. If you had no lights on, an intruder would need to use a flashlight, an action that immediately points him out. If you set your lights to be triggered by motion sensors, he will now be easily detected the moment he tries to do something against you and your home. This is even more effective if the sensors and the light are coordinated so as not to be tripped off at any mere motion, such as a tree blowing in the wind or by an real pedestrian walking by who is not interested in your property. For a motion sensor that repeatedly goes off, just like any poorly designed or ill-used alarm, is treated by others as someone who repeatedly and bogusly cries "wolf" and is ignored, so the sensitivity setting is VERY important. Consider the last time you heard a neighbor's car alarm once again blare off at night. Did you actually called the police to investigate? 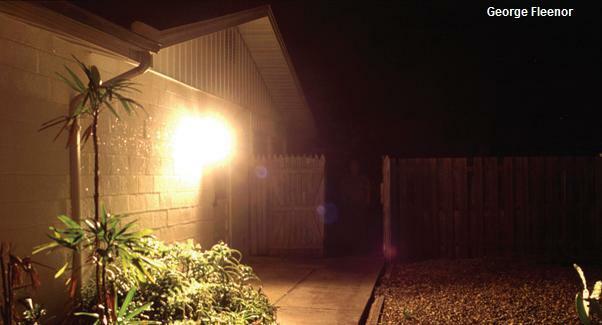 A even better method is to setup an OUTDOOR motion sensor that turns on an INDOOR light. That WILL make a burglar think twice about entering such a property. In addition, if you leave an outdoor light on at your home as you sleep, you could be creating a perfect location for vandals and graffiti artists to showcase their "work". Bad lighting at night can even make you LESS SAFE and be beneficial to criminals by creating deep shadows that offers concealment to them. Being temporarily blinded by a glaring light source makes you an easier target for criminals to attack as they hide dark recesses. In this situation, YOU ARE AT A DISADVANTAGE, see the IDA's FAQ page. Glare light is light that travels directly from its source to a person's eye, such as a car's high beams or a poorly aimed porch light. Glare light is counter-productive, for you need ten minutes for your night vision's sensitivity to increase a hundred-fold, but a full forty minutes for it to reach a thousand-fold sensitivity compared with your daytime vision. Only then can you really see at night. When outdoor lighting is usefully directed to the ground, you can often use a lower wattage bulb and save money as less of your light is thrown away. No Globe Lights -- those pole lights that are all glass, are bad "security" lights that prevents you from seeing in the shadows. These lights are nicknamed glare bombs for the almost all directional light the irradiate and are inherently less than 50% efficient. Their lack of shielding creates bright glare lighting that causes your pupils to constrict. Pupils in our eyes are miniature apertures or openings in front of lenses. The more open they are, the more light they let in. Our eyes also have a natural defensive reaction to strong lights. They constrict the pupils in the presence of strong light. This reduces the amount of the light that enters your eye, including that light comes to us from inside shadows. Hence an attacker can become better hidden because of a nearby, exposed, glare-bomb, light. However, when lights are shielded, less offensively directed light enters our eyes, so our pupils open up more, which allows us to see into darker areas. As a demonstration, use your mouse cursor to block the light in the picture on the left and find the intruder in the picture. Shielding lights makes an enormous difference between only feeling safe and actually being safe. Glare bomb lights make you only feel safe, because after all you may think that with all this light around here, nothing is going to happen to me , yet it is what is lurking in the shadows that you are now blinded to that can cause you problems. Shield the lights and now you have a much better chance to see what is in the shadows and hence actually become safer. These two images are distributed by the International Dark Sky Association and are gratefully displayed with permission from the photographer, George Fleenor. On the above right is a decorative, unshielded light that illuminates the exterior of a house, the house's driveway and car, the eaves of the house, the next house over, the houses across the street, and space beyond. Coming home to such a blinding light compromises your night vision. In such a blinded state, with your pupils constricted, are you ready to see if there is an intruder lurking around the corner as you head to the front door? Now you see them and then, CAN you see them? -- Here, too, you can move your mouse cursor over this image and observe as this person, initially standing on the path, moves to a new location in front of you. Here again, unshielded globe lights, or glare bombs , compromise your safety. Shielding lights makes an enormous difference between a false perception of safety and actually being safe . The glare that globe lights create blinds you to what is hidden in shadows, often directly under them, which is where the person moved to in the second picture. The person is directly below the light. These images are even more startling when one realizes that the person is wearing a white shirt and so, with the exception of the new location, is not really trying to hide. When you find the person you may note that, in fact, you can see that their white sneakers are in front of the light's pole. So the person isn't even hiding behind the pole and yet is still very difficult to see! The only thing that the globe lights seem to do well here is to illuminate the tree branches. Makes one wonder if they were worth the money spent to buy, install and run them. Shielded lights give you a much better chance to see what is in the shadows and hence actually help you become safer. 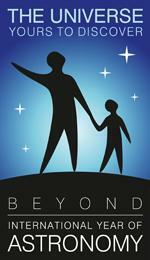 These two images were distributed by the International Dark Sky Association. The G-to-g contrast -- To express what these images show so that people can understand them better or maybe even take measurements so they can avoid creating a similarly unfortunate lighting situation, what is needed is to measure the source's glare intensity and compare it to the light reflected up from the ground. This gives us a glare-to-ground contrast ratio . If this ratio is high, then the lighting situation creates too much glare to see what is needed to be seen on the ground. Once again from the basic definitions of good lighting, we need to see what is being lit, not the light itself. Too high and the glare can become literally oppressive, very much like what is used in intense interrogation techniques. When the glare-to-ground contrast ratio is low, then we've achieved a comfortably lit and very useful lighting situation that does not cause problems elsewhere. No light should ever be emitted above the light source's horizontal plane. Once this simple guideline is followed, a great deal of the problems regarding light pollution are immediately dealt with and solved. What follows are some quick stories about how light pollution, or at least glaring lights, can give a rise to local crime levels, and how its absence can help drive the levels down. Remember: criminals need light too! Just because the lights are on, does not ensure that crime goes away. After all, what is the point of lighting an area, if there is no one around to stand guard watching the area concerned? There are those that continue to believe that more lighting leads to more security and less crime. It is so often repeated in that it has almost become a mindless mantra of the lighting industry and cliche with their TV commericials. If one extremizes this view, then one comes to the conclusion that times with the greatest amount of lighting must then have the least amount of crime. However, the following data from the FBI may then be seen as a strong piece of consistent evidence against that thinking. The Federal Bureau of Investigations, U.S. Department of Justice. Washington D.C. Question: does light inhibit crime? Well, one way to answer that is to look at data from the FBI of when acts of crime had occurred. An obvious trend in these FBI statistics seems to indicate is that police are figuring out more and more of when residential burglaries occur. TV shows and commercials present scary scenarios of a burglar coming in the middle of the night over and over again, that it makes for great drama that so plays to our primal fears. The FBI's data reports, however, that now over half of residential burglary crime actually occurs during the bright daytime, when most people are away from their homes at work and when criminals are up. Here are the percentages based on the stats that the FBI reports for the years 2004 to 2013. My own read on this data is that deadbolt locks are a better investment for your home security than any light on at night. Light does not prevent burglaries. Criminals need to see what they are doing. If light was a true preventative, then no crime should occur at all during the bright day time. However, that is not what the data shows. So, don't help criminals out with lights on at night. Make criminals point themselves out by forcing them to carry a flashlight! 2 The FBI reports that these years the numbers have been adjusted. From the prior's years UCR report, the numbers have gone up by 0.58%, 0.37%, and 0.28%, respectively. 3 The revised 2005 - 2009 numbers can be accessed at http://www2.fbi.gov/ucr/cius2009/data/table_07.html. 4 The 2010 numbers can be accessed in Table 23 at http://www.fbi.gov/about-us/cjis/ucr/crime-in-the-u.s/2010/crime-in-the-u.s.-2010/download-printable-files. 5 The 2011 numbers can be accessed in Table 7 at http://www.fbi.gov/about-us/cjis/ucr/crime-in-the-u.s/2011/crime-in-the-u.s.-2011/tables/table-7. 6 The 2011 numbers have been updated and can be accessed in Table 7 of the Property Crime Offences of the FBI's Uniform Crime Reports for Crime in the U.S. 2012. 7 The 2012 numbers have been updated and can be accessed in Table 7 of the Property Crime Offences of the FBI's Uniform Crime Reports for Crime in the U.S. 2013. U.S. Home Burglary Rate: 1 in 15 homes a day ?!?!? -- BOGUS!! I doubt anyone in the U.S. has to continually deal with two home break-ins a month! I then wondered what the actual rate would be and realized that with the research that I have been doing regarding issues about light pollution, I already had the numbers, all I had to do was to do the very simple math! So, on average, 1 home out of 29,476 will get burglarized a day. That also comes out to be 1 home out of 80.7 will get burglarized a year. While, it certainly says that you should do things like put in good locks on your home's doors AND use them, it is a far, FAR cry from the bogusly declared 1 out of 15 homes a day that the telemarketer claimed! (Additional tips are found down below in the What to do Before the Burglar Comes article. So next time you get that telemarketer phone call, you'll be prepared with some numbers for your rebuttal. Source: http://www.theargus.co.uk/news/5019988.Sussex_CCTV_scuppered_by_street_lights/, United Kingdom, Feb, 2010. One example of glare lights interfering with security comes from Britain. According to The Argus in the city of Brighton in Sussex county, three yobs vandalized a bookstore, causing 1000 pounds damage. The police there cannot identify them, even though the security cameras clearly show the vandals and their actions, because of the glare coming from nearby streetlights prevents them from being clearly identified. Not only did the yobs get away with the crime, but someone spent quite a bit of money on a CCTV system for no benefit at all. Published Monday, November 14, 2011 in Greenpoint - a community blog in The Daily Gazette of Central New York State. Margaret Hartley of The Daily Gazette of Central New York State has reported that towns across the country have been either removing or just cutting back on their street lighting, saving their budgets hundreds of thousands of dollars! And yet their police departments have not reported any increase in crime. "I had the police chief work up the crime stats, and found that most of our burglaries are taking place during the daylight hours." - Detroit Mayor Hubert Yopp as reported in the Detroit News newspaper. Rockford, Ill. removed 2,400 of their streetlights, for a savings of about $500,000 from the city's street lighting bill of $2.7 million. Their police chief said he's seen no evidence that crime increased since the streetlights were removed. Published Friday, November 25, 2011 in The Bristol Post. POLICE in the Bristol area have made a startling discovery - burglars are scared of the dark. Various locations have switched off their street lights automatically from about midnight to 5am. Of course, the towns have found that they are saving money in taxes. But in anticipation of public reactions to the street lighting switch offs, their police departments have been monitoring the crime rates in those areas. Their results have been coming in. "The police have told us they have not seen any notable increase in crime. In fact, in some areas, there has been a reduction of 20 per cent. I understand from the police that burglars don't like it when it's dark. They like to be able to see their escape route and they like to 'case' a premises before they strike. They would attract too much attention if they were using torches." Police figures show that in Bradley Stoke, the crime rate fell by 17%, in Thornbury by 28% and in Frampton Cotterell, the crime rate has gone down by 50%, compared with a year prior to the reports. Published: Saturday, April 14, 2012 in The Herts and Essex Observer. The towns of Broxbourne, Watford, Three Rivers and Welham Green have switched off their street lights automatically from about midnight to 6am. After looking at the evidence, the area's authority's scrutiny committee concluded there was nothing to suggest crime levels have been affected. "I'm pleased that the analysis has shown that there is no correlation between crime levels and changes to street lighting and trust that this finding provides reassurance to the public. In fact, Herts has seen an overall reduction in crime levels of over 6%, compared to the same period last year. However, we are never complacent and will continue to monitor trends to ensure that crime continues to reduce and that communities feel safe." This scheme's benefits have not only achieved a reduction in crime, but by also switching off up to 80% of their lights, they will save an estimated £1.3m a year and reduce carbon emissions as well. Published: Sunday 23rd June 2013 in The Argus. While Resident Association members blame that their street lighting switch off has caused a spike in crime, the local police have a different viewpoint. The police blamed unsecure homes and cars for recent crime in Peacehaven and Telscombe, not due to changes to street lighting. "A number of cars and houses which have been broken into were insecure so we are asking people to double-check their security. We have recently arrested a number of people for various offences. One recent success was charging a 46-year-old man with two counts of burglary. The number of reported crimes in the district has reduced by 8 per cent in the last year." In enacting this street lighting switch off plan, the East Sussex County Council hope to save £885,000 over three years by reducing energy, maintenance costs and light pollution. Peninsula School District, Gig Harbor, Washington. It turns out that vandals need lights, too, especially to display their work ! While this reprinted site from the California Energy Extension Service has no date on it, it does mentions some reports of different school districts REDUCING vandalism by turning the lights off! Battle Ground School District in Clark County has reduced vandalism to almost zero with a policy to darken their campus after 10:30 p.m. as had other districts. We are not aware of any school districts where blacking-out campus coincided with an increase in vandalism, burglary, or arson. There has not been an increase of such incidents in our district during the hours of total blackness. It seems logical that a blackout discourages youth from entering campuses -- they have as much fear of the unknown as anyone else. 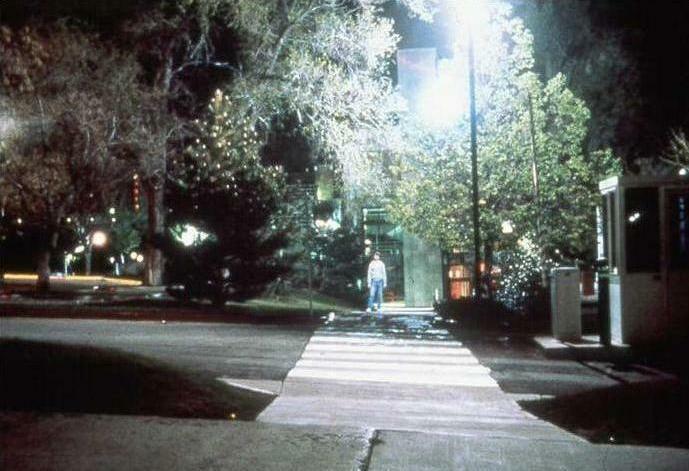 In case of burglars, any light shown on a campus is cause for suspicion on the part of neighbors and police. -- Bill Bakers, retired Associate Superintendent for the East Side Union High School District in San Jose, who pioneered an energy savings program that has saved over a million dollars per year. In early August, 2011, I had asked a veteran police officer from the city of Milwaukee, Wisconsin, about the topic regarding locations of vandalism and nearby lights. He told me that from his experience, the situation in a general and broad context is not as simplistic as the above report makes it seem, but considering the particulars of the above situation, it does not really contradict it either. I had asked whether he had observed if vandals worked their art on surfaces that was only illuminated by a nearby light. The thinking is that if it is too dark, then the vandals should not be able to see well enough to bother working. He reported that this was not so for more experienced vandals. They seem to be able to make their work in lit or dark conditions. But, he did think that it was rather true for younger and more inexperienced vandals. This makes sense for the Gig Harbor story, as those that may try to vandalize a school would probably be those that attend it. As a counterpoint, consider this report from CNN. In the report, it shows gangs vandalizing buildings, particularly lit up buildings that the gangs perceive belong to upper classes, because they are frustrated with their own economic situations. But from a different point of view, not only do streetlights obviously allow the gangs to congregate like the report shows, but the lights on the buildings provide a huge canvas for them to highlight their work. They are even apparently willing to risk their lives to do so. Lights on the buildings creates quite a vain statement that, in a way, is almost begging to get vandalized, especially as some of these members live in bad conditions right across the street from the buildings. While I can understand and sympathize with the gangs frustrations, vandalizing buildings is not going to change their own economic situations. And as for the building owners, you may want to consider that a better security plan might just be to simply remove the lights, un-lighting the way for these gangs to climb up the buildings and save the expense of the electricity bills. Research and Analysis Unit, Illinois Criminal Justice Information Authority, Chicago, Illinois. The following review is of a very interesting report by the City of Chicago in their attempt to reduce crime by increasing the lighting levels on the streets and alleys. What is specifically interesting about this report is that it is more scientific in its data collection than others I have read about. In which, they compared two different city areas that had very similar characteristics with respect to demographics, socio-economic status and crime, and measured the results of both areas as they increased the lighting in just one area. In doing so, they actually provided an experimental area and a control area to their investigation. The Goals - In October of 1998, the City of Chicago's Mayor's Office and the Dept. of Streets and Sanitation began a multi-stage plan to reduce crime through improved street and alley lighting. The first part of the plan sought to upgrade and improve the city's 175,000 streetlights, which illuminate the arterial and residential streets. The second part of the plan involves repairing and upgrading the lighting in and around viaducts and Chicago Transit Authority stations. The final part of the plan has been to boost lighting levels in alleys across the city as a tool for public safety and fighting crime. 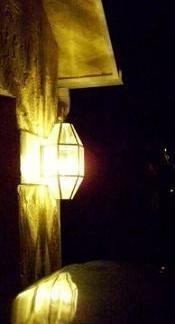 The Changes Made - In the past, 90 Watt lights illuminated most city alleys. The Dept. of Streets and Sanitation increased the alley lighting levels by installing new fixtures to accommodate 250 Watt bulbs. The intent of the program was to increase feelings of safety and decrease crime in the alleys surrounding Chicago's residential and arterial streets by increasing the wattage and number of alley lamps. The Evaluation - The Illinois Criminal Justice Information Authority was directed by the General Assembly to undertake an evaluation to assess the impact of increased alley lighting on crime. Specifically, this evaluation attempted to measure the effect of increased alley lighting on crime rates in two eight square block areas, with particular emphasis on crimes that were most likely to have occurred in alleys. The 28th political ward (Police District 11), the area of West Garfield Park, served as the experimental area and received increased alley lighting beginning in August 1998. The 16th political ward (Police District 7), the area of Englewood, served as the control area and did not receive increased alley lighting during the study period, but did receive some improvements afterwards in May 1999. Both the experimental area and the control area were very similar with respect to demographics, socio-economic status and crime. The evaluation did not examine public fears or perceptions. The Hypothesis - While it was not anticipated that alley lighting would deter all types of crimes, some crimes may be more susceptible to the unique characteristics of an alley. Therefore, violent crimes (homicide, criminal sexual assault, robbery, assault) and property crimes (burglary, theft, motor vehicle theft, arson) were examined initially. Researchers also focused attention on a third crime category called non-Index crimes, such as prostitution, damage and trespass to property and vehicles, gambling, and drug/liquor/weapons violations. Previous research suggested that these forms of non-Index crimes are the offenses that may show the majority of change when additional lighting is installed, due to their nature. Additionally, alley lighting can only plausibly affect crimes that occur after dark, and only where the lighting was installed. 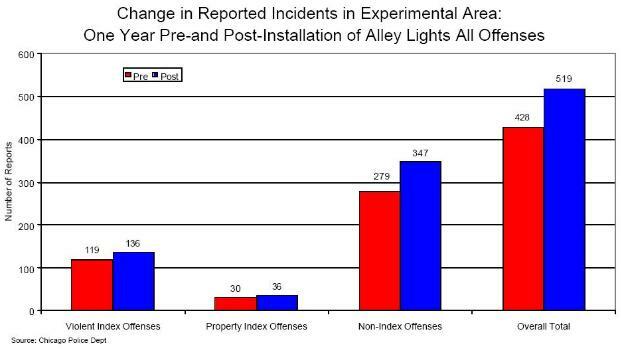 Based on these factors, the basic research question was whether or not the increased alley lighting resulted in fewer alley crimes after dark in the experimental area overall. These results were also compared to a control area. A comparison between incidents reported during the daytime and those reported at night was also made. What Was Tested - The researchers first examined the change in the experimental area that received increased alley lighting over a one-year period prior to increased alley lighting and a one-year period after the change. Then they also examined the change for over a six- month period before and after the experimental area's increased alley lighting and in the control area that did not receive the increased lighting to determine differences between the two areas. Only six comparable months of data of the control area were used as the alley lights were already improved in it by the time analysis began. Regardless of whether the one year analysis revealed a localized impact on crime in the experimental area or not, it is possible that improved alley lighting had an effect on the experimental area when compared to another area of the city that did not receive the lighting. Finally, variations in offenses that occurred during the day versus those that occurred at night were examined, based on the reported time that the incident occurred. Remember, this change caused a nearly continual threefold increase in the electricity comsumption and expense for the city and its tax payers. However, this probably would not achieve what the city leaders expected or planned as the result, for people's vision does not appreciate light at the same rate as electrical costs go up. This point is covered in our light pollution vs. astronomy web page. This change also had the hidden expenses of increase of sky glow, which accompanies a decrease in the quality of life for residents and sleeplessness in city residents, probable increases of breast and prostate cancer risks in city residents, along with possible increases in obesity of city residents. I do not know how much of the environment is left in Chicago, however, outside it, plants and animals even further away than before the change would also be affected. 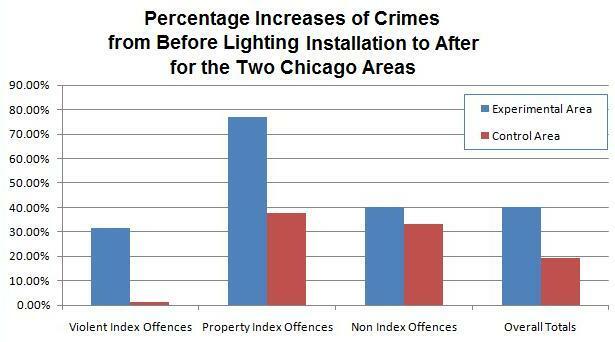 Before and After Experimental Results - The figure shows the total number of incidents, as well as the specific violent, property and non-Index crimes in the experimental area of West Garfield Park for one year before and after alley lighting installation. The numbers and percentage increases for this area are based on data that only represented those reported incidents that took place at night and in alleys. When the number of reported incidents for this one year analysis was examined, the data indicated that there were 428 total incidents reported in the pre-installation period and 519 total incidents in the post-installation period - an increase of 21% in reported offenses occurring the night between the pre- and post-period test. Each of the three crime categories experienced an increase in the number of reported incidents between the pre and post-installation period. Violent Index offenses increased 14% (119 to 136), property Index offenses increased 20% (30 to 36) and non-Index offenses increased 24% (279 to 347). Of the non-Index offenses, it was the Substance Abuse Violations that contributed the most to the increase (161 to 243), a 51% increase. Comparing Day and Night Experimental Results - A comparison was also made of the number of reported incidents during the day to the number of reported incidents at night in the experimental area. Again, there was the 21% increase in reported evening incidents that occurred in alleys (428 to 519), but when daytime offenses were analyzed, there was a 7% observed decrease (638 to 593). The net total of offenses comes to 1066 for pre installation to 1112 for post installation, a 4% increase in all reported incidents. Non-Index offenses, which account for the majority of both day and evening reported incidents, showed a similar trend. Reported non-Index incidents that took place during the evening increased 24% (279 to 347), while daytime incidents decreased 10% (456 to 409). Net totals: 735 pre to 756 post, a 3% increase in non-index crime. Again, the number of substance abuse violations influenced the increase of overall non-Index offenses. The number of evening reported incidents involving substance abuse violations increased from 162 to 243, a 50% increase. However, the reported substance abuse violations that occurred during the day did not change. These findings may suggest an increase in the reporting of offenses created by better alley lighting or it may suggest that the better lighting conditions provides an attraction for criminals to act at night. This especially seems apparent due to the decrease in their daytime activities. 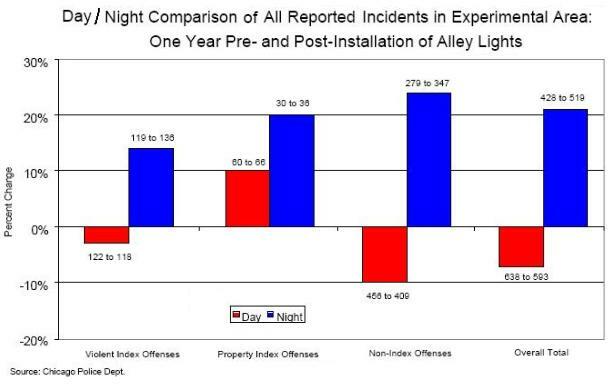 Day and Night for Experimental and Control Comparisons - A comparison was also made in the number of reported incidents during the day to the number of reported incidents at night in both the experimental and control areas for six months prior to improved alley lighting installation in the experimental area and six months after. Both the experimental and control areas saw increases in reported incidents at night and decreases in reported incidents during the day. The following chart compares the percentage changes for reported incidents of crime between the experimental and the control areas. A breakdown of non-Index offenses showed that reported substance abuse violations during the evening increased from 77 to 123 (60%) in the experimental area, but daytime violations decreased from 187 to 152 (19%). Net totals: 264 to 275, a 4% increase in substance abuse violations. Reported substance abuse violations in the control area increased from 30 to 52 (73%) during the evening, but also decreased from 69 to 33 (52%) during the day. Net totals: 99 to 85, a 14% decrease in substance abuse violations in the control area. The experimental area had an increase of 21% in reported offenses between the year before and the year after the test, with substance abuse showing the greatest increase. Increasing the alley lighting, contrary to expectations, effected crimes during the day by decreasing them. As it was now easier for criminals to see at night, why commit crimes when everybody is up and about during the daytime? Substance abuse violations underwent the greatest changes in activity, predominately by increasing activities at night due to the increased lights. Conclusion - Whether or not the increased lighting levels showed more crime occurring so that it could be reported to police, or the increased lighting attracted criminals so that they could see what they were doing and what was going on around them, the clearest statement that one could make on this is these findings is that the increased lighting did not deter crime. In fact, not only was there no suppression on criminal activity, but the activity level seemed to increase as a result of increased alley lighting, as reported by the Chicago Police Department. Once again, criminals need light too. They prefer to act at night because the rest of the populace, being at home asleep, is not looking. Substance abusers, however, especially need to be able to see their veins in order to "shoot up". How long will it take for people to accept the idea that we light up the night, only because of primal fear of it, not because of the fact it does anything? Postscript - Remember that the achievements of this effort do not just affect the citizens of Chicago security. It also affects their wallets, health and environment. But I do not have to show that here. Folks closer to the city in question are probably better able to explain what is happening to them. The Illinios Coalition for Responsible Outdoor Lighting covered the expense of the city's lighting on their page. Post Postscript - Lighting Progress in Illinois, USA -- Illinois resolution HR #0884 passed the full State House of Representatives unanimously on March 17th, 2010. Read the full resolution here. Illinois, you are taking a step in the right direction! - - the effectiveness of lighting [as a crime deterrent] is unknown. Results are mixed. We can have very little confidence that improved lighting prevents crime, particularly since we do not know if offenders use lighting to their advantage. The authors examined different studies of the effects of adding lighting to particular areas that were considered to be highly prone to crime. The studies covered a nearly twenty year span of time and found that very little could actually be said about the data. One big problem is that most of the studies did not look at or even have "control areas", an area that was similarly highly prone to crime and yet did not have any change in its lighting. As such, each study could only tell of before and after lighting changes. Wouldn't that tell if a new lighting plan worked? Well no. For there could have been other simultaneous factors that also contributed to the change in crime. Maybe a crime prone area was caused by a small number of very active criminal actors. A change in just one of those could easily account for some of the slight changes seen. We may speculate that lighting is effective in some places, ineffective in others, and counterproductive in still other circumstances. The problematic relationship between lighting and crime increases when one considers that offenders need lighting to detect potential targets and low-risk situations (Fleming and Burrows 1986). Consider lighting at outside ATM machines, for example. An ATM user might feel safer when the ATM and its immediate surrounding area are well lit. However, this same lighting makes the patron more visible to passing offenders. Who the lighting serves is unclear. One of the sources of the problem with people's feelings of safety and the effectiveness of lighting efforts is the fact that people's perceptions of lighting levels is logarithmically based meaning it grows slower than the actual amount of light that is given off. This fact is explained in the section on Astronomy, Our Perceptions of Light, and the Impact of Light Pollution. In comparison to our perceptions, the expense of electricity is directly linear. Thus the electrical costs go up much faster than what people can or will appreciate of the lighting. As if just to prove the example of the above theory, the following are two stories of actual robberies that did took place at ATMs. Source: WCVB TV 5 The BostonChannel, an ABC affiliate., Jan 2004. A woman in Hudson, Mass., was robbed at knifepoint at an ATM machine alone late at night. I decided to stop at the ATM because it is in a well-lit area and it looks very safe and the police drive by and there were plenty of people around, the Hudson woman said. The woman said she stopped at a freestanding ATM located at the Hudson Shopping Center at Washington Street and Technology Drive. 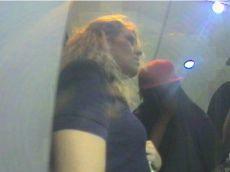 As she was preparing her deposit, she said a man wearing a mask approached the kiosk. Somebody was coming in with a Halloween mask on, and I just froze and processed it for a second and then this person entered and had a knife, she said. She said the ATM was like a closet with no way out. I just closed my eyes and blocked my ears and kept my face to the wall and kept saying, 'Just take my money. There is a lot there for you, don't take my life.' Afraid can't even describe it. I felt like I was seeing myself on a video camera in a horror movie, she said. The alleged victim said she hopes her experience can help prevent others from becoming victims, too. I saw a well-lit area and I thought, no problem, what would happen here? And I want people to just not look at this and change the channel. I want people to stop and think for a second that this happens, and there is no place that this can't happen, she said. Source: WPEC CBS 12, West Palm Beach, FL, Oct. 8th, 2010. A 26 year old woman was robbed at gunpoint at an ATM outside the Bank of America at 105 N. Congress Ave. on around 2:50 a.m. on Oct. 4th. She had just made her deposit when two men approached her demanding money. She argued with them, arguing that there were cameras there. She was ordered to take the money out and show us what you got. She begged not to be robbed and tried to walk away when they attacked her. They hit her in the head and tried to shove her in her car. They shot a round into the ground, before hitting her in the stomach, which made her drop her wallet. They searched it, but did not take anything and fled. While the victim may be right that there were cameras about, their use is horrible. Look at the picture and note what you can see there. You can see her face and the lights in the ceiling behind the men. But you can NOT see the attackers' faces! And someone designed the layout this way? Was it never tested for the safety of its users, at night!? This is yet another example how glaring lights create shadows that criminals, without even trying, can use to their advantage. If anyone knows any information about this incident, please submit it via www.bbpd.org or call Crime Stoppers of Palm Beach County at 800-458-TIPS. It is not if the burglar comes, but when. Because, say the statistics, the burglar is coming. Down your street and looking for easy targets. This page has a number of tips in it that helps you to prevent criminals from coming to your home. Nowhere, however, does it say on their pages that one should bath their yards in bright, glaring light! The page provides basic security precautions will make your home less inviting as a target. And that's the whole idea! So share them with friends and neighbors. And leave the lights off!